In this blog post I'm going to discuss what a solid inbound marketing strategy is composed of. By the end of the blog post you'll have a better understanding as to why your inbound marketing efforts may not be achieving your goals. First things first: What is "Strategy"? Strategy is simply a careful plan or method for achieving a particular goal usually over a long period of time. So your inbound marketing strategy will be a long-term plan that helps you reach a goal. But you already knew that. That long-term plan has 6 distinct parts. Raise a virtual hand if you're familiar with Stephen Covey's 7 Habits Of Highly Effective People? Well if you are, then you know that Habit #2 is "Begin With The End In Mind", and that an essential part of beginning with the end in mind is having a Mission Statement. This is not only effective in your personal life, but in your business as well. An inbound marketing Mission Statement sets the tone for your inbound marketing. It provides the WHY you do what you do, which gives you context before you move into the WHAT you do. So your inbound marketing Mission Statement is going to communicate what it is that your inbound marketing stands for. Next, you want to identify that one thing that's going to set your inbound marketing strategy apart from the crowd. If your competitors all have blogs, what is going to make your blog stand out from the pack? Inbound marketing and content marketing are gaining popularity each day, and with that has come a flood of online content on just about every topic imaginable. So how is your content going to stand out? Refer back to your Inbound Marketing Mission Statement and think about the messages you want to communicate, how they will differ from your competition, and how they'll evolve over time. 98toGo's One Thing is that we focus on helping you develop, execute and evaluate Inbound Marketing Strategy. Our focus on Strategy is what sets us apart from others in our space who could potentially be writing about similar topics. Identifying your One Thing is going to give you a major advantage as you execute your Inbound Marketing Strategy. So we've moved through the esoteric steps, and now we're getting our hands dirty with some numbers! Step #3 is all about having S.M.A.R.T. Goals in place that your organization is striving towards, and having Key Performance Indicators (or KPI's) that will let you know if you’re moving in the right direction towards reaching your goals. So what are S.M.A.R.T. Goals? KPI’s are simply the things you’re going to be paying attention to as you track your progress towards reaching your goals. Here’s a list of example business goals and KPI’s. *Note, the goals in this list are not S.M.A.R.T. Goals. If you choose to use them for your organization then be sure to make them S.M.A.R.T. by using this free template. The next step is to get crystal clear on who you’re targeting. I’m not talking about your target market. That’s not enough. You want to know the specific TYPE of person within your target market who is suffering most from the problem that your product or service best solves. You will most likely have multiple buyer personas that you’re targeting, each with their own unique set of needs, wants, desires, pain points, etc. The idea with a Buyer Persona is to know your ideal buyer inside and out. You want to know the things they like, the things they dislike, what motivates them, their fears, their interests, general demographic information, and more. Knowing these things -- being inside the mind of your ideal buyer -- will give you tremendous advantage as you’re creating inbound marketing content and messaging that appeals to that ideal buyer. Here is a blog article I wrote all about Buyer Personas. Now that you know who your ideal customer is through your Buyer Persona, the next step is to do some detailed research on what will attract and engage your audience most effectively. You’re trying to understand the information that your audience needs to know from you. Publications -- what industry websites, blogs, podcasts, magazines, etc., is your target audience consuming? Trending topics -- what topics are hot in your industry right now? Competitors -- what topics are your competitors writing about (especially the ones getting a high amount of social media engagement)? What types of content are they producing: blogs, videos, infographics? Hashtags -- what are the popular social media hashtags that are currently being used? Influencers -- who are the influencers in your industry? What are they talking about and sharing regularly (topic and content type)? Upcoming events -- what popular events are coming up in your industry? A tool like Buzzsumo is excellent in performing research of this type. Your goal in this step is to come away with a number of topics that you can create content on. Our recommendation is to have 4 topics -- one for each quarter of the year. Now that you have your 4 major topics, perform some additional research to come up with individual content ideas for each topic. Again, look at Publications, Competitors, and Influencers to see what each is writing about under each of your 4 topics. The goal at this point is to have a list of ideas under each topic that you can develop into new content. Now that you have a list of ideas for each of your 4 topics, you want to look at your own content to see if you already have some of these ideas created. Chances are you have already created some of this content in some form, and can repurpose it (or reuse it). Why make 100% new content when you can dust off and enhance something that you’ve already created! Ultimately, however, you will identify content that you do need to create. When you have your list of content ideas that need to be created, you want to put those on an editorial content calendar. 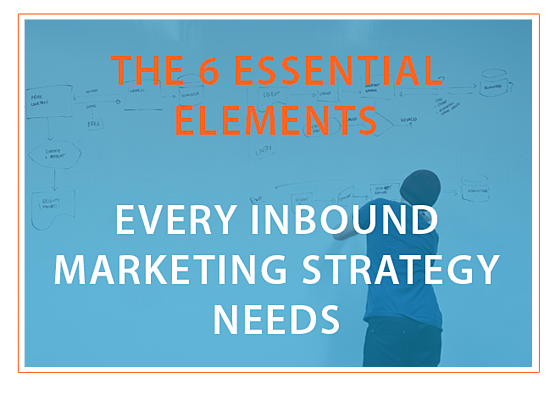 So I must have hit "Publish" prematurely, because there are actually 8 essential elements to an inbound marketing strategy, not 6. Luckily for you I've put the last two elements in a free pdf. These final two elements will complete your inbound marketing strategy and will ensure you have everything you need to achieve the results you've been wanting. Click the button below to grab essential element #7 and #8 to creating an effective inbound marketing campaign.